Get an exclusive look inside the Boyz II Men residency show in Las Vegas with a peek into their sound check session with the new ShowTickets.com Insider video series. The exciting new ShowTickets.com Insider series debuts with a behind-the-scenes look at a pre-show sound check from legendary R&B group, Boyz II Men. The original series from ShowTickets.com gives audiences an insider’s look at what goes on behind the curtains of Las Vegas’s most popular productions. See the first video here! It’s time to discover the raw talent of Las Vegas. ShowTickets.com Insider aims to be that outlet for travelers to enter into the wonderful world of Las Vegas entertainment. From pre-show rituals to cast interviews to behind-the-scenes access, audiences will witness what it takes to produce Las Vegas shows, and make it easier for guests to choose the best show for a Las Vegas visit. 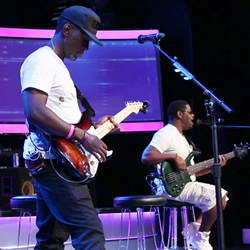 The Boyz II Men sound check exclusive invites fans to watch as the group prepare for one of their many extraordinary residency performances at the Mirage Hotel and Casino. Named Best Headliner Show and Musical Artist of the Year, this ShowTickest.com Insider takes a look at Boyz II Men (Nathan Morris, Wanya Morris, and Shawn Stockman) warming up their vocals, tuning their instruments, and discussing their beloved work. What are their favorite songs to sing and why they decided to pick up instruments and play live in their Las Vegas residency show are explained, as they check their sound levels for the night’s performance, and cover Lay Your Head On My (Pillow). This will be the first look inside Boyz II Men at the Mirage Hotel & Casino with more to come on the Grammy-winning trio. ShowTickets.com is an Entertainment Benefits Group Company (EBG). Offering the best deals on the most popular shows on Broadway, Las Vegas Strip, and in Orlando, ShowTickets.com provides guests with invaluable information about shows and entertainment options, ensuring the best entertainment choice is always made. From previews to reviews, and even behind the scenes looks, ShowTickets.com provides guests with all the information needed to make the right choice for entertainment options in New York, Las Vegas, and Orlando. In addition to savings on popular shows, customer support is always available from customer service agents 24/7 and 365 days a year via phone and internet. ShowTickets.com is Tickets Made Easy.